Concord University professor and former Phaneuf Group member Timothy D. Corrigan. 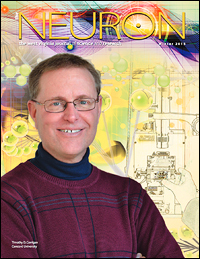 Former Department of Materials Science and Engineering (MSE) postdoctoral research associate Timothy D. Corrigan is on the cover of the Winter 2015 issue of The Neuron, the journal of the West Virginia Higher Education Policy Commission’s Division of Science & Research. Corrigan, who is currently an assistant professor of physics at Concord University in Athens, W.V., was a member of MSE professor Ray Phaneuf’s research group from 2004-2009. He worked on metal enhanced fluorescence, developing highly efficient molecular fluorescence assays based on exciting plasmons in nearby silver nanostructures. These days, Corrigan and his students are exploring the use of quantum dots as an alternative to fluorescent molecules commonly used in bioassays, sensors, and optical circuits. The dots are more stable than fluorescent markers, which fade out after a relatively short time.